To maximise time on the hills and save some annual leave for warmer times, we decided to travel north overnight using the wonderful First Scotrail Caledonian Sleeper from London Euston. We left it a little late to get a get a bargain berth (one way tickets from only ), so we made do with a reclining chair each for only a little more money. Setting off from London just before midnight, we woke to the sound of bagpipes (or was it commuters on their way to work?) in Edinburgh seven hours later. A short stop off allowed time to get a quick breakfast, and then northwards again to our destination of Kingussie. Kingussie lies to the west of the main Cairngorm plateau, and is about as typical a Scottish highland town as you can imagine. With an appetite built up from the strenuous journey, and the thought of 48 hours without such an opportunity again, we sought out the local cafe and indulged in some solid carbohydrate loading. Thanks to the ladies at Pam's Pantry for the great food and hospitality, and to their guests for their interest in our kit and our sanity! From the town we headed south-east on the road past Ruthven Barracks. This is an impressive ruin worth a closer look, but with a long day planned to our overnight accommodation, we pressed on to Tromie Bridge and our last brush with civilisation for a couple of days. Our target for the day was the beautiful glen of the River Feshie, where Tim had recommended a lovely little bothy somewhere along the banks. The weather was deteriorating as forecast, with some strong gusts of wind blowing through the hills and dampness in the air. The conifer plantations kept off the worst, though, and we made good time. Turning right at the meeting of Glen Feshie, we headed south along the banks of the river in diminishing light in search of the elusive hut that was to be our resting place for the night. The Mountain Bothies Association works "to maintain simple shelters in remote country for the use and benefit of all who love wild and lonely places" and what a wonderful job they do. We don't want to spoil the tranquillity of this particular place by advertising it's location, so join them, give them your money, and make use of the places they care for. Should you discover this one, you will find it warm and dry, with a wood burning fire, plenty of room to cook and sleep, and fresh water and a 'flush' toilet a few steps away (well, a bucket's supplied and the stream is only ten feet away). Day 2 dawned bright but windy, with a wonderful pink sunrise to waken the senses. Our initial plan was to head eastwards and upwards, into the hills around Mullach Clach a Bhlair. But with an ever increasing strength to the wind, we exercised due caution and opted to stick with the glen, heading south to stay low until the wind was on our tails. As we headed further into the hills, majestic views emerge, with the promise of more to come. We were heading for the metal bridge over the River Eidart, but before reaching this there are several wide and deep tributaries that require both care and patience to cross. However, having chosen the right travel companions for the trip, both were in evidence as we skipped across the stones, and it was only the perspiration from our heavy sacks that made us a little damp. From the bridge, we began 'heather bashing' across the slopes of Cnapan Mor, a difficult task at the best of times made harder by the soft crust of snow. 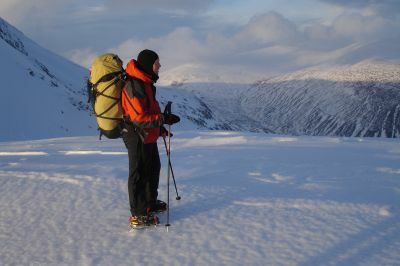 But as luck would have it, we happened across some tracks left by a passing Snowmobile, and with crampons attached we strode northwards to the pass between Leac Ghorm and Beinn Bhrotain. At this point we had planned to drop down into Glen Geusachan, but dangerous large cornices had built up on the north slopes; with the associated avalanche risks, we continued instead over the summit of Monadh Mor and gained access to the valley from the west. By that time, light was failing and we had to don our headtorches for the final miles round Devil's Point to the bothy at Corrour. The plan was to meet some friends who had walked up from Aviemore, and we were pleased to find them with a welcome brew waiting for us. However, as is the danger with the free accommodation, another group had also arrived (although we were in no way complaining - the hardy mix of Scottish and Welsh 'Munro Baggers' had shunned the lightweight approach and lugged 10kg of coal with them to keep us all toasty warm for the night) and with the limited space in the hut, we opted to brave the elements and bivvy in the shelter of the wonderful new compostable toilet. It was a dramatic bedroom, low cloud, bitterly cold, the imposing Devil's Point looming ominously just to the south, and in the middle of the night we found that we weren't alone (insert drum roll)... in the eery twilight hours, we were woken by two sizeable deer, and thankfully not the devil, grazing just by us. The forecast on Day 3 had changed noticeably from when we left home, and with aching limbs from the previous days exertions, we opted for the easier option off the hill, the Lairig Ghru. This long pass through the heart of the Cairngorms was once the main drove road to the south, and is a challenging excursion in it's own right. 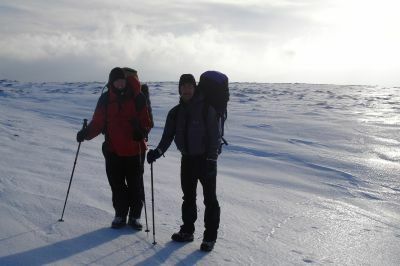 We were only tackling a section of it; easier, but not entirely without effort, as the icy conditions underfoot meant the mind couldn't wander too far, as we slipped over the pass between Sron na Lairige and Cairn Lochan at the Pools of Dee. 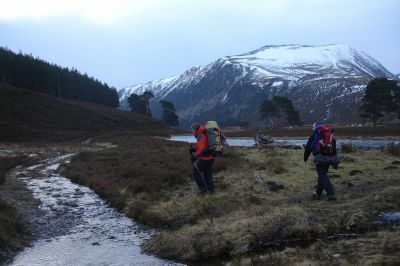 From this point on it was pretty much downhill towards the vast forest of the Rothiemurchus Estate. Our walk had a beautiful end as we meandered through the pines towards Loch an Eilein, and onwards to a night of relative comfort at YHA Aviemore. The journey back to the South Coast the following day wasn't without a hitch, as it was the day that winter made a visit to London for the first time in years. But all credit to the train companies for getting us home in a timely manner for the princely sum of A fitting icy end to a fantastic long weekend of true Scottish conditions.